Contained as follows are genuine copies of just a handful of email correspondences we have received testifying to the superior standards of our products and services offered. Delighted customers range from from large, established corporations to small / medium businesses. Limited detail has been published in line with our privacy statement. "I love the cards, thank you for the excellent service, much appreciated." "Just wanted to thank you for your help in getting the Christmas cards here so swiftly." "Thank you for your speedy delivery. The cards are perfect and the chocolates went down a treat with the team!" "We will always return to your company for our cards. Great service and quality, thank you once again." "The cards have just arrived, thank you so much for sorting it out, my boss is happy!" "Thank you so much for the end result, we were really pleased with the cards! Thank you also for the mints! Be sure to add me as a contact for future." "They look great, thanks for turning them around so quickly. Can I request that you put me on your mailing list for a brochure for next year." "As usual you have done a great job!" "Many thanks for your efficient, prompt service"
"Just wanted to say thank you for a great service, our cards arrived today as promised and I am very happy with them. I will make a point of recommending your company via word of mouth and social media." "As usual the cards are terrific, put that together with the excellent printing and delivery is it any wonder why we keep coming back year after year." "I believe in festive fairies. You are magic!" "They look great and I am very impressed by the fast turnaround"
"Thanks for your help in creating the new proof for me! Appreciated the effort you put in to making sure we were happy." "Thanks so much, great service"
"Thank you. We love them!" "Just got the Christmas cards, thanks so much again, they are lovely, and thank you for the sweets, I shall eat them tonight while I watch tv! I have put a recommendation on Facebook so that any friends that we have that have cards printed for their businesses can have a look at what you have to offer." "I know we placed a 'late in the year' order and appreciate you managing to process and deliver so quickly. We certainly know other companies do not have such speedy service as yourselves and I can't recommend you highly enough!" "Just wanted to let you know that the personalised cards have arrived and I am very pleased with them." "The corporate cards arrived today, many thanks, I think they look brilliant...great service!" 09/11/10 "Just taken delivery of my Christmas card order, I love them, great service, will certainly use this website again"
06/10/10 "Cards arrived today and look terrific! Great service, really fast response, just a note to say thank you. We will use you again!" 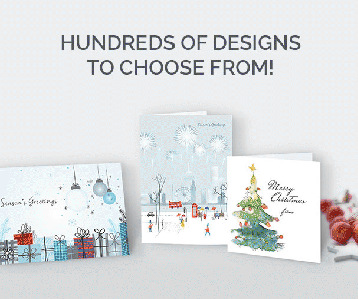 17/12/10 "Many thanks for the very fast turnaround of our Christmas cards. We ordered late so to get them to us when promised was great service. Very happy with the design and artwork too! Will buy again. Next year we won't leave it so late." 22/11/10 "Many thanks for the cards which arrived last week, I'm delighted with them, and the speed, helpfulness and efficiency of the service you've provided. I'll be back next year!" 30/11/10 "Just to say thank you for the wonderful service you have given us. The quality of the cards is good and the ease of using the site fantastic. We are very pleased with the speed and efficiency of the process and will definitely be using you again. I very rarely say this but please add me to your mailing list! " 22/10/09 "Many thanks for supplying our Corporate Christmas cards for Kingsley Specials. The cards are of great quality and will be a hit with our customers. Thanks for a prompt and professional service and we are happy to recommend you to anyone and will hope to use you again next year!" 18/09/08 "Many thanks the cards arrived this morning and look fabulous, we are really pleased with them and the speedy service we have received!" 25/09/08 "Cards have arrived this morning, thanks for your speedy efficient service as usual!" 18/11/08 "The cards have arrived and look great!" 12/11/08 "Many thanks for your excellent service"
13/10/08 "We have received the cards and they are great!" 16/11/07 "We received the cards today and they are great. Thanks!!!!!!!!!!!" 11/10/07 - "You remembered me - I'm suitably impressed that your records are so good. You sure know how to make a customer feel valued, thank you!" 26/09/07 - "Hi, We just received the xmas cards and they are fantastic, thanks for the speedy delivery, we are all very pleased." "I just thought I'd send you a quick email to let you know that our cards arrived earlier this morning. They are absolutely perfect, thank you for all your help, I'll speak to you again same time next year!" "Hi, the cards were received as expected on Saturday 14th. We're very pleased with them and the speed of your service. Thank you!" "Hi, we received the cards this morning, they're lovely. Thanks again for being so accommodating, I know I wasn't the easiest customer to deal with! I'll be diverting all the family's orders to you next year as well." Click the CCC logo at the top to return to the index page.